Special Thanks to Garry Kief, Richard Goldman, Les Joyce, Irene Minett, Walt Zifkin, Michael Ameen, Clive Davis, Tucker Cheadle, Roberta Kent, Nina Foch, Karl Ellis, Lou Genetti, Susan Borgeson, Rebecca Larsen, Bill Swan, Jack Pierce, and of course, Linda, Bagel and Biscuit. Extra Thanks to all of my friends and fans for giving me the encouragement and support to make this album. This album that I love so madly. Loving Thanks to my Step Father, Willie Murphy, for introducing me to this kind of music before I knew that I was blessed. Barry Manilow plays a Yamaha C-5 piano. This album was more than just another album for me. It served to remind me of why I had gotten into the music business. The title and the concept came to me in a dream. I always know I’m onto something when I get ideas in dreams. These projects always go smoothly. 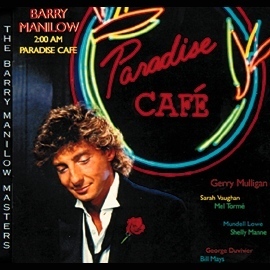 PARADISE CAFE was composed and recorded in less than two months. My dear writing colleagues and I finished composing all the songs within weeks. It took no time for me to arrange the entire album. And all the stellar musicians and singers agreed to join me without hesitation. Working with these legendary men and women for an entire week was a thrill I will never forget. Hearing them play and sing my music was one of the most profound gifts I have ever received. Out of all my albums, this is the one I’d like to be remembered for.